- AWA Southern Tag Title Tournament (November 10, '86) = Badd Company (Tanaka & Paul Diamond) lost in the first round to Tarzan Goto & Akio Sato. Jeff Jarrett & Billy Travis won the tournament. - AWA Southern Tag Title Tournament (July 11, '87) = Badd Company won over Jeff Jarrett & Big Bubba, Bill Dundee & Rocky Johnson, and Scott Hall & Steve Keirn, before falling in the finals to Jeff Jarrett & Billy Joe Travis. - AWA SuperClash III (December 13, '88) = Badd Company & Madusa Micelli were beaten by Derrick Dukes, Ricky Rice, & Wendi Richter. - UWF Intercontinental Tag Title Tournament (August 16, '92) = Tanaka & Bulldog KT defeated Jerry Lynn & the Lightning Kid and Cooli SZ & Kendo to win the tournament. - WWF WrestleMania VI (April 1, '90) = The Orient Express (Tanaka & Sato) won, via Countout, over the Rockers. - WWF Summerslam '90 (August 27) = The Orient Express were beaten by Jim Duggan & Nikolai Volkoff. - WWF Survivor Series '90 (November 22) = The Orient Express, Sgt Slaughter, & Boris Zhukov fought in an "Elimination" Match against Tito Santana, Nikolai Volkoff, & the Bushwhackers. Tanaka was eliminated by Santana, who was the sole 'survivor'. - WWF Royal Rumble '91 (January 19) = The Orient Express (Tanaka & Kato) fell to the Rockers. 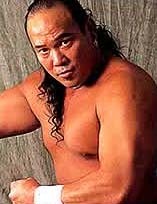 - WWF Saturday Night's Main Event #29 (April 15, '91) = Tanaka competed in a "Battle Royal", which was won by Mr. Perfect. 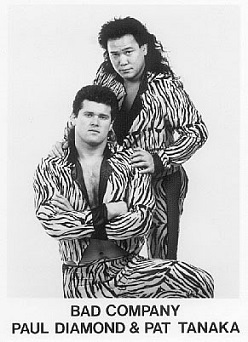 - WWF UK Rampage '91 (April 24) = The Orient Express (Tanaka & Kato) lost to the Rockers. 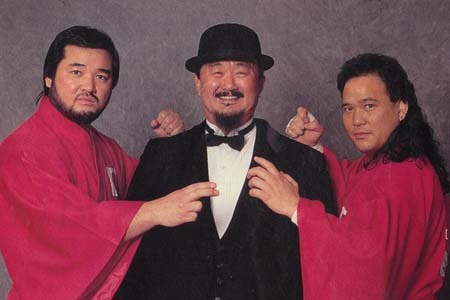 - WWF Royal Rumble '92 (January 19) = The Orient Express (Tanaka & Kato) were beaten by the New Foundation. - AAA La Revencha (August 28, '93) = Tanaka, Lover Boy, & El Mercenario took down Piloto Suicida, Mando Guerrero, & El Mercurio. - ECW Bloodfest: Part 1 (October 1, '93) = Badd Company lost to the ECW Tag-Team Champs, Tony Stetson & Johnny Hot Body. - ECW Bloodfest: Part 2 (October 2, '93) = Badd Company beat the Public Enemy. - ECW Terror at Tabor (November 12, '93) = Badd Company took down Don E. Allen & Mr. Hughes. - ECW Holiday Hell '93 (December 26) = Tanaka won a "Body Count" Match over Rocco Rock. - ECW November to Remember '93 (November 13) = Badd Company lost a "South Phily Hood" Match to the Public Enemy. - ECW The Night The Line Was Crossed (February 5, '94) = Tanaka & the Sheik defeated Kevin Sullivan & the Tazzmaniac. - ECW Ultimate Jeopardy '94 (March 26) = Badd Company fell to the Bruise Brothers. - WCW Spring Stampede '94 (April 17) = In a dark match, Tanaka & Haito defeated Dave & Kevin Sullivan. - WCW Halloween Havoc '96 (October 27) = In a dark match, Tanaka lost to Jim Powers. - WCW SuperBrawl VII (February 23, '97) = In a dark match, Tanaka was pinned by Ultimo Dragon. - FMW Bunka Gym (November 12, '00) = Tanaka, Damien Blade, & Brad Elliot lost to the WEW Six Man Tag-Team Champs, Kaori Nakayama, Gedo, & Jado. - FMW Korakuen Hall (January 16, '01) = Tanaka & Chris Candido were beaten by Goemon & Onryo. - NJPW Sumo Hall (February 16, '01) = Tanaka, Koji Kanemoto, Gedo, & Jado lost to Wataru Inoue, Masayuki Naruse, Jushin Liger, & El Samurai. - NJPW International Center (October 28, '01) = Gokudo, Chris Candido, & Jado fell to Jushin Liger, Masayuki Maruse, & El Samurai. - NJPW Prefectural Gym (December 11, '01) = Gokudo, Koji Kanemoto, Gedo, & Jado lost to Kendo Kashin, Jushin Liger, Minoru Tanaka, & Black Tiger. - NJPW Fighting Spirit Memorial Day (May 28, '02) = Gokudo, Black Tiger, & Gedo were beaten by Masahito Kakihara, Curry Man, & Masayuki Naruse. - Wrestle Reunion I (January 29, '05) = Tanaka fell to Christopher Daniels.